Wow. The past few days have been crazy to say the least. If you've been keeping up with me on Twitter or the private M$M Facebook page, you've probably seen some of the stuff that I've been posting about Hurricane Harry since I happen to live in Houston. A lot of you have asked how I'm doing since the storm hit (which is much appreciated btw). You never realize how many good readers you reach in this business until people you don't even know are legitimately concerned about your well-being. First of all – my entire family is safe and healthy. My parents' house, the house we are building, our apartment, and my mother-in-law's house somehow stayed dry. Unfortunately, my sister's house took on water, and I have many friends that have lost everything. This storm was historically terrible. My area took on 50+ inches of water, and most of the neighborhoods around us were completely devastated by flood damage. I'm going to walk you through what it was like to be here during the storm, as well as ways that you can help the people of Houston as they recover from this disaster. This is just from my perspective, which was much more fortunate than tens of thousands of people in this city. Anyone who has lived in Houston for a while has been through some type of storm prep. We've had big storms before, but obviously, nobody here has ever seen anything like this one. There's always a little bit of a nervous buzz around the city before a potential hurricane comes our way. The last storm we had was Ike several years ago, so things have been pretty quiet lately other than some floods that the city has gone through more recently. Before Ike…there was Rita. Rita was the storm that we all evacuated for, and then it ended up completely missing us. A lot of people have been wondering on social media why we didn't evacuate for Harvey, and most Houstonians would probably point to their Rita experience as the answer. The Rita evacuation was terrible. Everyone who tried to get out was stuck on the freeway for hours. 70+ people died, and the storm didn't even hit us. So most people went around on Friday getting water and some canned food and sheltered in place at home. It was actually pretty hard to find supplies because the grocery stores weren't really prepared for the rush. It felt like Harvey took most people by surprise. A lot of that was due to how quickly it upgraded from a tropical storm to a category 4 hurricane. The news was starting to say that it was going to be pretty bad. Coral and I decided to load up our valuables and the pets and drive over to my mother-in-law's house. I figured if we were all together we wouldn't get cut off from each other by any potential flooding. My parents decided to stay at their house and my sister stayed at hers. We spent most of Friday just hanging out and watching the news. The storm was just a few hours away from making landfall and we were already starting to get some pretty heavy rain, but nothing crazy. It had rained pretty badly through the night as Harvey made landfall in the Corpus Christi area, but it was still clear enough to drive around in the morning. I took a trip back to our apartment to get more food and a few things before the next round of rain came. 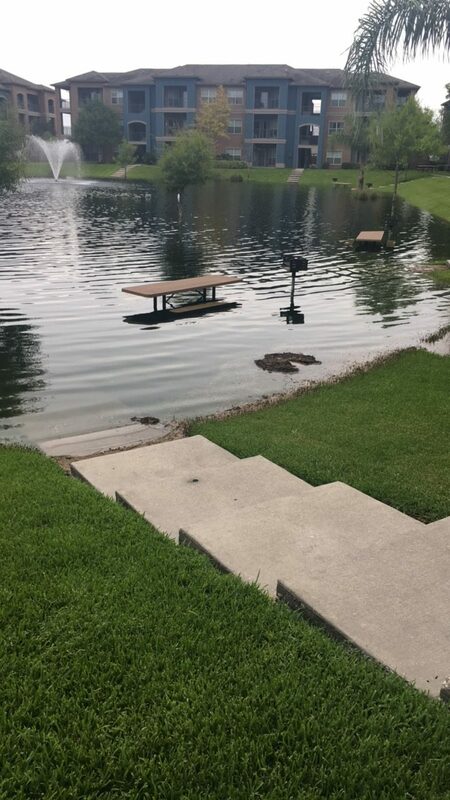 Our apartment complex has a big retainer lake in the center of the property, and it had already been filled up about 4-5 feet higher than normal. When I got back to my mother-in-law's, it really hit us. Saturday and Sunday probably blended together for most people in Houston. The thing that made Harvey so bad is that it stalled to the Southwest of Houston and just kept pounding the city with rain surges for hours and hours late Saturday night and into Sunday morning. We have all seen a lot of rain in Houston, but this felt biblical. The radar images looked like Harvey had put huge straws into the Gulf of Mexico and was just dumping it on us. Every time a rain surge passed us, another one filled its place. The weather people started telling everyone that they had never seen anything like this event. They said a storm like this had always been a “Could it actually happen?” scenario. Not very comforting, right? I stayed up until 4 am on Sunday morning, just watching the water come up our driveway and flood several cars in the neighborhood. To judge the depth of the water, I was looking at a van parked across the street. The water eventually covered up the Chevy emblem on the front. It was insane. Watching flood water is one of the most helpless feelings you can ever have. You know there is nothing you can do to stop it. Nothing. That, in addition to the crazy flood images we were starting to see on the news made me start planning for the worst. I was ready to get the ladder out just in case we needed to go to the roof. We also had a ton of animals in the house (2 dogs and 5 cats), and I started trying to figure out which ones we would have to leave and which ones we could take with us if we were going to request boat rescue. I'm a legit animal lover, so even thinking about that was heartbreaking. At the same time, my mom and sister were calling me and telling me that their houses were about to flood. I couldn't help them. It was so frustrating. All I could do was hope that they were safe. I went to bed fully expecting to step in water when I woke up, but somehow the rain had stopped and the water was halfway up the front yard. We were trapped in the house, but thankfully dry and had electricity. I still have no idea why we didn't flood or lose power, but I can tell you that we were so much more fortunate than much of the city and the neighborhoods immediately around us. After I got up and started brushing my teeth, I noticed all of the sounds. Fan boats, helicopters, car alarms (still have a helicopter flying overhead as I'm writing this). It was just so…bizarre. I walked outside and saw a Coast Guard helicopter circling our neighborhood, and then I realized that the neighborhood about 100 feet behind us was completely flooded. While the rain had stopped, Coral and I also walked around to go check out the reservoir at the back of the neighborhood. It was full. I've never even seen it at half capacity. Just crazy. From Saturday night to Sunday morning, we received more than 20 inches of rain, and it wasn't over yet. It started raining heavily on Monday night again, and it was a gut punch for everyone that had either flooded already or were borderline after Sunday night. I woke up again on Tuesday fully expecting the neighborhood to be flooded, but again…somehow it wasn't. Finally the storm had started to move on. We got a few more pockets of heavy rain, but by the evening the water behind the house was low enough that I could back my truck out. Coral and I hadn't seen or heard about our apartment or new house in days, so I figured I would try to get to them if the roads weren't bad. Unfortunately, a lot of people get swept away in their cars after big flooding events, so I had a rule of turning around if I ran into any water on the roads. I made it to the apartment and it was fine. It would have flooded a little bit, but before we left on Friday I had taken towels and stuffed them in the patio door. They actually kept the water out. Pretty crazy. I tried to make it over to our new house but ran into a creek that had overflowed outside of its banks. There were boats driving around on the street (think about that for a second) and rescuing people, so I figured it was best to turn around and try again the next day. After getting back to my mother-in-law's house, we heard that a shelter had opened up down the street. We gathered as many supplies as we could and went to drop them off. At this point, it was really starting to set in that A) we were unbelievably lucky, and B) this was so much worse than we could have ever imagined. Everyone that hadn't flooded started to get out of their neighborhoods and help the people that had received flood damage. By this point, thousands of people were in shelters around the city, and the flooding was actually still getting worse in spots as water started flowing down from the northern part of the city. Some people that had made it through the entire storm without taking on water started flooding even when it was clear and sunny outside (as if they needed another punch in the gut). We spent a good chunk of the day helping my sister rip up carpet, flooring, and drywall from her house. At the time of writing, the entire city is still reeling from what happened. Some businesses have been able to open, but so much of Houston still has flooding issues. A curfew has been in effect for a few days now, so even the businesses that are open are closing early every night. It feels so weird driving around on roads that are less than half as full of drivers as they used to be. Eventually, Houston will be alright…but it's going to be bad for a while here. One of the most incredible things about the M$M community is how nice and caring all of you are. I've already had people reach out to me and offer to give financial aid to my family, friends, and anyone else I know that needs help. A church from Arkansas has “adopted” my sister's family and is helping financially. I have friends whose parents have lost everything, and I've been able to line up help for them as well. This is going to take months and probably years for the city to recover from. Most people don't realize how destructive flooding can be. Even one inch of water in your home can cause tens of thousands of dollars in damage. Some of you have asked me to find people in need that you can directly help with financial contributions. I'm more than happy to facilitate this (set up GoFundMe accounts, provide contact info, etc. ), but please understand that donations of this nature are not tax deductible like a normal donation to a charitable organization. I'd only recommend this route for people or organizations who either don't care about the deductions or don't like funneling money through charities for various reasons. You can email me directly at Bobby @ millennialmoneyman.com if this is something you're interested in. I'd be happy to line up a family that I know is in need. Even though the last thing I was thinking about was money during the storm, this whole experience has only solidified to me how important it is to push a message of getting in control of your finances. The people who don't have emergency funds are going to really struggle until insurance, donations, or FEMA aid becomes available. It's heartbreaking, and just another reminder that emergencies can and will happen in life. You have to be prepared as much as you can be. I've also realized even more that “stuff” isn't nearly as important as most of us think it is. I can't tell you how many people were interviewed on the local news that lost literally everything, but were thankful for being alive and that their family was safe. You can always replace your stuff. You can't replace life. Have you ever been through a natural disaster? I’ve never had to endure a dramatic natural disaster before. We’ll be ready for a tornado and a blizzard here but that’s about all we’ll get in MN most likely. Glad you guys are safe and okay. Yeah definitely got lucky. Coral got out and did some volunteer work yesterday while I worked, and we’ll both be doing whatever we can this weekend. Still have to get my sister taken care of but it will be ok. So glad you and your family made it through the storm safe and unscathed! I’ve family in Houston who were flooded. It’s going to take them a while to get everything back to even half of normal. Thank you – sorry to hear that about your family. They’re definitely not alone. Insane. Glad you guys are ok. This disaster will be a marathon clean up and rebuild not only of possessions but of spirit. Being alive and healthy is first and foremost. The next part will be healing the loss. In the PF community many are quick to talk about minimalism and ditching “things”. Minimilism is great when it’s a choice, but those who have lost everything have also lost items of sentimental value. Baby pictures, family heirlooms, homes. To have everything ripped away is not easy – even if they are just “things”. Rebuilding from the inside out takes time, support, faith, and love. I am touched to see how many people are stepping forward to wrap their arms (and wallets) around Houston and the surrounding areas. Keeping y’all in my thoughts!! PS – Another great organization is the Houston Food Bank. And if anyone can’t give financially, the Red Cross also needs blood supply. Give what you can! Yeah this is going to take a long time. Even just driving around our area, the damage is extensive (and we had it easier than most). And I agree – everyone hates on “stuff”, but seeing all of it destroyed at once is pretty heartbreaking. Unbelievable! I am glad you are safe and it seems things are going as well as they can! This whole thing is tragic and like you said it does make you think about money and how easy things can be destroyed just like that. I feel bad for everyone who lost irreplaceable things like pictures and videos of kids or grandkids! Hopefully, everyone can get in there and the clean up will go smoothly! On a side note, I wonder how many people will take a positive out of this natural disaster and potentially start saving more or even living with less stuff. On the last point – who knows. I think people are more focused on just rebuilding what they had, which is valid. Can’t imagine what it’s like to lose the irreplaceable stuff. Harvey was a catastrophe for Texas. I’d also urge people to give to organizations assisting the devastated coastal towns of Rockport and Port Aransas. These areas are where Harvey made landfall, and few structures were left standing. Glad to hear you and your family are safe and relatively unimpacted. It’s very important to be prepared, you never know when the next disaster will strike. Thanks! Yeah we’ll be fine. I left Houston a week ago Thursday for a wedding. I was planning to come home Monday then leave Tuesday to do training in 2 towns in California. I took my training supplies in case the weather was bad. I can’t get a flight to Houston so I am going to Dallas. No rental cars available until Sunday. None available in Austin either. My house is fine and so is my car in the IAH airport. I have been thinking of people who don’t get paid when they don’t work and people with no emergency fund. A stash of cash is important when card scanners don’t work. I evacuated for Rita with only $5 cash (didn’t think!!!) and spent 26 hours “driving” what normally is a 2 hour trip. It was miserable and Bobby is right. Many said never again. It’s so hard to explain how bad Rita was haha. It took us 14 hours to get 45 minutes away. We had to break into my Aunt’s house for shelter, and then the storm missed us. This gives me chills. It’s horrible seeing the images online, I can’t imagine seeing it first hand. Definitely motivation to maintain healthy finances. While these natural disasters are rare, they are devastating and unfortunately money plays such a big role. Crazy story, thanks for writing this up. So glad to hear you and your family are safe. Houston will definitely be in our thoughts and prayers! No problem – I’m glad we’re safe too! Thanks for the real perspective of what it was like. That is so scary and couldn’t agree more that it is so important to be financial able to handle stuff like this for your fam. This literally gave me goosebumps and gave new feelings towards wanted to call everyone in my life to tell them I’m glad they are safe (even if they aren’t in Houston, just being safe and healthy). Second – I’d recommend also going through Facebook or Google to get matches on your contribution. Glad you and your family are safe, with others getting help! No problem – I figured maybe the story would help people that were on the fence about donating to jump in. Thank you for sharing your story. Glad your family is safe. It takes real events like this for many people to realize what is important in life. It is definitely not “stuff”. It must have been terrible and seems like for many people it still will be for a while. I of course heard the news and seen the pictures, but reading such stories from 1st hand is something different. I’m glad that you and your family is safe! Do I read well that 80% of the people have no flood insurance? Can they expect some aid from the state or the central government? Or people with no saving can only rely on charities? Yes, 80% don’t have flood insurance. Flood insurance is only required for people who live in flood plains by the creeks and rivers. FEMA helps with costs, but they have a rating system based on your level of flooding that determines how quickly you receive aid. Normal insurance won’t cover the damage, so a lot of people are going to rely on loans or donations until they get aid. Those stats that you listed are mind boggling as well as sad! We’re glad you and your family are safe and the damage wasn’t as bad as it was for others. Thank you for sharing your story. I’m happy to hear that you and your family are safe. My husband is from Houston and has some family down there. One uncle lost his house during the last big storm and had to rebuild on stilts. Luckily everyone stayed dry during this hurricane. I couldn’t imagine deciding which pets to take on a rescue boat. Thank goodness it didn’t come down to that for you! Bobby, I’m glad to hear you and your family are alright overall. It’s just heartbreaking what people had to go through. Sure makes you appreciate what you have and understand what life is really about.